Accusations of illegal payments, match-fixing and bribing officials and players has taken place since the early days of football being played in Britain. However, very few cases have resulted in people being punished for these offences. Major William Sudell had great success with Preston North End and won the first Football League championship in 1888-89 without losing a single match and acquired the name the "invincibles". Preston also beat Wolverhampton Wanderers 3-0 to win the 1889 FA Cup Final. Preston won the competition without conceding a single goal. Preston also won the league the following season. However, in 1894 Sudell was sent to prison for embezzling £5,000 from his employers. He was using this money to fund illegal payments to his players. In 1899, Francis Payne, the secretary of West Ham United, was given the task of finding good players for the club's first season in the top division of the Southern League. According to one report, Arnold Hills, gave Payne £1,000 to find the best players available. Payne employed an agent and former professional footballer named Charles Bunyan to obtain a player based in Birmingham. Bunyan missed his appointment with the player targeted by Payne. He then approached another player he thought might be interested in joining the club. However, this player reported Bunyan to the Football Association. The FA held an investigation into the matter and as a result, Bunyan was suspended for two years. Payne was also suspended and the club was fined £25. In the 1899-1900 season Burnley struggled in the First Division of the Football League. Unless the team beat Nottingham Forest on the final day of the season, they would be relegated. Burnley lost 4-0. After the game, the Nottingham Forest captain, Archie McPherson, claimed that Burnley's goalkeeper, Jack Hillman had tried to bribe his team to lose the game. Hillman was called to appear before the Football Association. The FA refused to believe Hillman's claim that he was only joking and he was banned from football for 12 months. He not only lost a year's wages but a £300 benefit. In 1902 Newton Heath was £2,670 in debt and faced a winding-up order. At a shareholders' meeting in the New Islington Hall, Harry Stafford, the captain of the side, announced that he and four local businessmen, including John Henry Davies, were willing to takeover the club's debts. The Football League approved the plan and Newton Heath now became Manchester United. Harry Stafford, along with Davies, became a director of Manchester United and James West was appointed as manager. Davies arranged for John J. Bentley to be appointed as president of the club. However, at the end of the 1902-03 season West and Stafford were suspended by the Football Association for making illegal payments to players. In his defence, Stafford claimed: "Everything I have done has been in the interests of the club." Stafford never played professional football again. In the 1904-05 season Manchester City needed to beat Aston Villa on the final day of the season to win the First Division championship. Villa won the game 3-1 and City finished third, two points behind Newcastle United. After the game Alec Leake, the captain of Aston Villa, claimed that Billy Meredith had offered him £10 to throw the game. Meredith was found guilty of this offence by the Football Association and was fined and suspended from playing football for a year. Manchester City refused to provide financial help for Meredith and so he decided to go public about what really was going on at the club: "What was the secret of the success of the Manchester City team? In my opinion, the fact that the club put aside the rule that no player should receive more than four pounds a week... The team delivered the goods, the club paid for the goods delivered and both sides were satisfied." This statement created a sensation as the FA had imposed a £4 a week maximum wage on all clubs in 1901. The Football Association now carried out an investigation into the financial activities of Manchester City. They discovered that City had been making additional payments to all their players. Tom Maley, the manager, was suspended from football for life and City was fined £250. Seventeen players were fined and suspended until January 1907. City was also forced to sell their players and at an auction at the Queen's Hotel in Manchester. The Manchester United manager, Ernest Mangnal signed the outstandingly gifted, Billy Meredith for only £500. Mangnal also purchased three other talented members of the City side, Herbert Burgess, Sandy Turnbull and Jimmy Bannister. This became the core of the side that won the Football League championship in the 1907-08 season. Thomas Gibson Poole was chairman of Middlesbrough. Rumours began to circulate that he was involved in illegal activities. The Football Association also carried out an investigation of the club and uncovered book-keeping irregularities including the chairman keeping gate receipts and owing the club money. As Nick Varley points out in his book Golden Boy: "In the manner of these things down the ages, it was settled quietly and all but forgotten until four years later when allegations were made that Boro and Newcastle fixed a match to give the Geordies, preparing for a Cup final, an easy ride. The allegations were not proved, but hardly helped Boro's tarnished image." On 27th June, 1910, Thomas Gibson Poole appointed Andy Walker as manager of the club. Soon after his appointment, Walker was accused of illegally trying to sign one of his former Airdrie players. Walker was found guilty and banned for four weeks, while the club were fined £100 for the offence. Thomas Gibson Poole wanted desperately to be the city's member of parliament. However, at that time, the country had a very popular Liberal Party government. Working closely with David Lloyd George, his radical Chancellor of the Exchequer, Herbert Asquith introduced a whole series of reforms including the Old Age Pensions Act and the People's Budget that resulted to a conflict with the House of Lords. The Conservatives, who had a large majority in the Lords, objected to this attempt to redistribute wealth, and made it clear that they intended to block these proposals. David Lloyd George reacted by touring the country making speeches in working-class areas on behalf of the budget and portraying the nobility as men who were using their privileged position to stop the poor from receiving their old age pensions. After a long struggle with the Lords, Herbert Asquith and the Liberal government finally got his budget through parliament. A General Election was called to take place on 5th December, 1910. Thomas Gibson Poole was to be the Conservative Party candidate for Middlesbrough in the election. It seemed that Poole was bound to lose as the Tories were seen to be trying to halt the redistribution of wealth that was taking place. Poole became convinced that his best chance of victory would be if Middlesbrough beat Sunderland, the club's bitter rivals, in the Football League game that took place on 3rd December 1910. On the day of the match, Andy Walker offered Charlie Thomson, the captain of Sunderland, £10 for him and plus £2 for each of the players as long as Middlesbrough won the game. Thompson refused to take the money and reported the conversation to Sunderland's trainer, Billy Williams. Middlesbrough won the game 1-0. However, this result did not have the desired political impact and Poole lost the election by 3,000 votes. Billy Williams told Fred Taylor, the chairman of Sunderland, what had happened. The matter was reported to the Football League. On the 16th January 1911, Thomas Gibson Poole and Andy Walker were suspended from football for life. Middlesbrough supporters believed that Walker was only following orders and a 12,500 people signed a petition to the Football Association to reconsider his ban. They refused to do this and Walker was forced out of his profession. 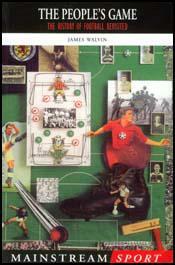 At the end of the First World War it was decided to increase the First Division from 20 to 22 clubs. One solution to the problem was to allow the relegated clubs in the 1914-15 season, Chelsea and Tottenham Hotspur, to remain in the First Division. However, Henry Norris, the Arsenal chairman, disputed this idea. Norris, who had just been elected to the House of Commons as a Conservative MP, argued that a great deal of match-fixing had gone on in the 1914-15 season and that league positions should be disregarded. The reason for this was that Arsenal had finished in 5th place in the Second Division in the 1914-15 season and therefore had no grounds for being elected to the First Division. It was decided to give Chelsea one of the vacant places in the First Division. However, Norris persuaded the league chairman to vote on the other club to join them. Arsenal won the ballot with 18 votes. Spurs only got 8 whereas Barnsley, who finished 3rd in the Second Division in the 1914-15 season, received 5 votes. Many people were of the opinion that Norris had bribed his fellow chairmen in order to win the election. In 1927 the Daily Mail reported that Henry Norris had made under-the-counter payments to Sunderland's Charlie Buchan as an incentive for him to join Arsenal in 1925. The Football Association began an investigation of Norris and discovered that he had used Arsenal's expense accounts for personal use, and had obtained the proceeds of £125 from the sale of the team bus. Norris sued the newspaper and the FA for libel, but in February 1929 he lost his case. The FA now banned Norris from football for life. At the end of the 1953-54 season Middlesbrough was relegated to the Second Division. Wilf Mannion refused to sign a new contract with his club and announced his retirement from football. Mannion began work as a journalist with the Sunday People where he wrote a series of articles exposing corruption in football. He claimed that a Football League club had illegally offered him £3,000 to sign for the club. He also added that he was offered extra money for "a job in name only as a salesman". He also told of being offered £15,000 to join Juventus. In December 1954, Wilf Mannion joined Second Division Hull City for a fee of £4,500. Mannion remarked "I'm happy to be back in the game again. My urge to play again was so great that I happened to be in the mood when approached by Hull." He also admitted that he wanted to join up again with his great friend and fellow rebel, Neil Franklin. Mannion was now once more under the authority of the Football League and in February 1955 they demanded he reveal the name of the English club that attempted to bribe him to leave Middlesbrough. When he refused he was banned from playing football for life. (Much later Mannion confessed that the club was Aston Villa). The Football League also ordered Middlesbrough not to pay Mannion his accrued benefit money. By 3rd December 1910 we were flying in the Football League and clear favourites for the title. Sunderland took a fourteen game unbeaten run to Ayresome Park, and with Boro' struggling at the wrong end of the table, it was obvious to all that a Sunderland victory was on the cards. The Middlesbrough Chairman, Lieutenant Colonel Poole, had different ideas. He was running for parliamentary elections on the Monday and believed that his candidature and votes would be boosted if his side could beat Sunderland. Then there was the sterling example set by chairman Lieutenant-Colonel Gibson Poole, the man who bought Common. After another transfer swoop the following season, for the acclaimed England international Steve Bloomer, rumours began to circulate that a number of other clubs had helped Boro, struggling again, with their purchases because they all wanted to see Bury go down. Both league and FA inquiries uncovered book-keeping irregularities including the chairman keeping gate receipts and owing the club money. In the manner of these things down the ages, it was settled quietly and all but forgotten until four years later when allegations were made that Boro and Newcastle fixed a match to give the Geordies, preparing for a Cup final, an easy ride. The allegations were not proved, but hardly helped Boro's tarnished image. The goals-for-votes scandal cemented Boro's reputation for rogue finances. By 1910, the Lieutenant-Colonel was trying to move from football into politics by standing as a Conservative in the General Election. With the Liberals favourites to win, he needed all the help he could get - for example, his team beating Sunderland two days before polling. Some of the Boro players had spoken during the campaign on behalf of their chairman, while the Liberals were forecasting, rather disloyally, a Wearside win. On matchday, manager Andy Walker decided to do his bit and approached the Sunderland captain with an offer of £10 for him plus £2 for each of his players as long as there was a home victory. The skipper told his trainer, who told the Sunderland chairman, who told the FA and, although Boro won the game 1-0 through entirely fair means, the club was in dire trouble. Weeks earlier it had been fined £100 and Walker banned for a month after he made an illegal approach to a Scottish player. It had been their final chance and the new offence meant Poole, who lost the election, and Walker were banned for life. The remaining directors were warned that if there was any more rule-breaking Boro would be banned from the Football League. Because I dared to tell the truth about the evils of the football transfer system I am out of the game for good. That is the result of the ultimatum given to me by the Football League. Either I must disclose the name of the club that tried to bribe me to leave Middlesbrough or I must deny that what I wrote was true. I will do neither. They used to call me the Golden Boy of soccer but I reckon the halo is a bit tarnished now. From now on I'll be the Naughty Boy of soccer to the Football League. That's all right by me. At least my case will serve as a warning to other professional players who try to tell the truth. You can whisper these things in the dressing-rooms; talk of them behind closed doors; but for goodness sake don't let the public know.